Recently, we were asked about the worst roads we had ever been on. Hmmm, there’s a post in that question, I suddenly thought to myself. Thomas and I sat down to reflect on the thousands of roads we had traveled – the breakdowns, the potholes, the drop-offs, the landslides, the dust, the terrifying drivers – and came up with a list of some of the most challenging stretches we had experienced. As with all such questions, the year we traveled these roads is also relevant because things change. Here’s a list of our roughest roads. 1,000 kilometers (600 miles) over roadless desert in clouds of dust with daytime temperatures reaching 50C (128F). You couldn’t even count the number of times we got stuck in the sand – and all that without a functioning car battery. Every time we got stuck, all the passengers had to get out and push the bus to pop-start it!!! At points, the vehicle drove up onto huge slabs of sandstone to bypass sandy stretches. This was without a doubt one of our most painful trips ever. It certainly was the hottest. 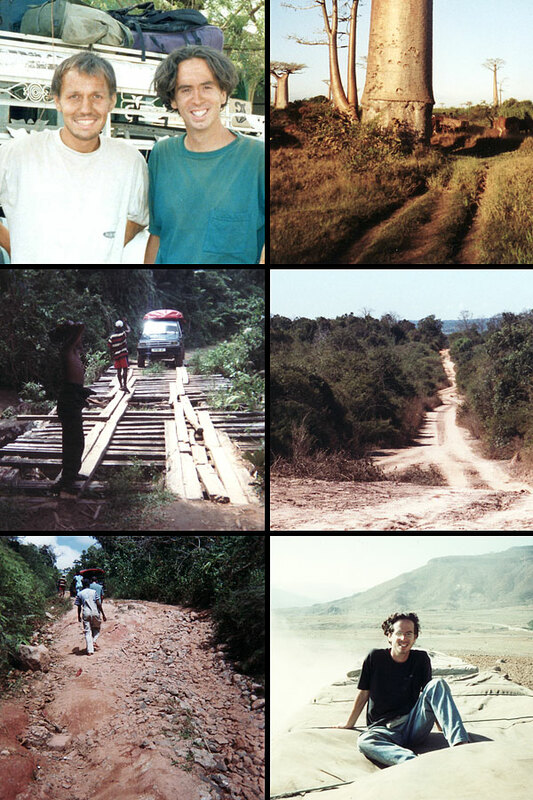 When we crossed Ethiopia in 1994, the entire road network qualified as some of the worst roads on the planet. We traveled more than half of the country on the back of aid vehicles. 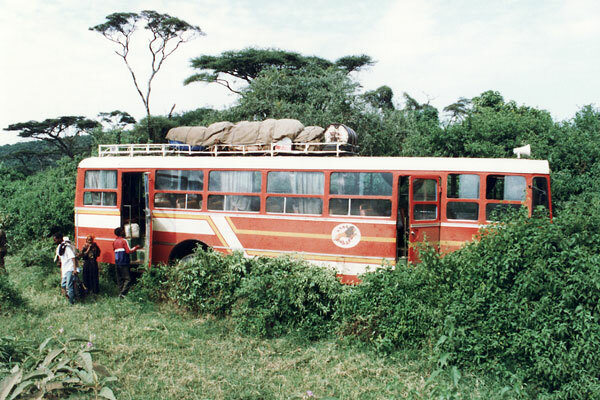 Highlights included being stopped by bandits with machine guns, some of the slowest travel we’ve ever experienced, and having one bus we were traveling in shoot off the road into an enormous bush (see pic above). The road to Lalibela will always stick in my mind as one of the roughest roads we’ve ever traveled – it’s amazing we didn’t end up with concussions. Because of a disruption in flights, we were forced to travel out of the interior of the Honduran Mosquito Coast overland. 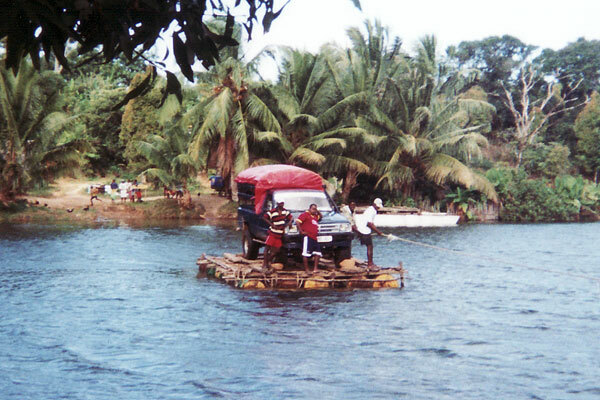 From Las Marias, we traveled on foot and by canoe until we reached the Garifuna villages on the coast. Some of the villages were connected by beat-up, overloaded public cars. These lone cars, which had been brought in by boat, were essentially trapped between major river systems. 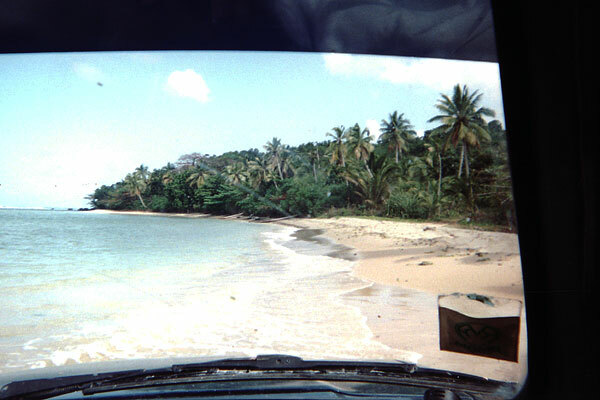 We slowly bounced from one community to another driving through the jungle and along beaches until we worked our way to Trujillo. Of course, there was lots of mud involved!!! Madagascar in 2003 would also have been on the short list of contenders for “world’s worst roads” (with the key exception of the well paved north-south road). The road from Toliara to Fort Dauphin was a 600-km stretch of bone-rattling pothole. The tracks to Tsingy de Bemaraha were a muddy mess. But the Queen Mother of nasty roads was the nightmare leading south out of Maroantsetra towards Toamasina. Potholes the size of refrigerators, wooden “bridges” on the verge of collapse, floating the car across multiple rivers on a raft, and long stretches of driving on the beach. This is the only place I’ve ever been where I was hit by a wave INSIDE the car. The road became so bad that Thomas and I had to get out and walk a 55-km (35-mile) stretch which had become impassable. Thomas and I visited Eritrea shortly after it declared its independence from Ethiopia. After 30 years of war, the infrastructure in the country was a mess. 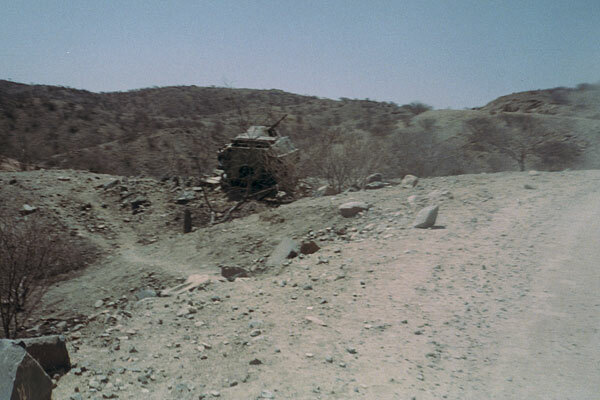 Most of the bridges had been bombed out and the dirt tracks were littered with blown up tanks and jeeps. 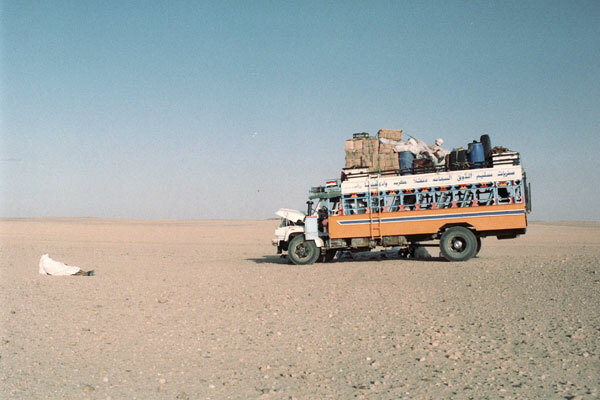 The crossing into Eritrea from Sudan was a series of vague trails through an acacia-covered plain. 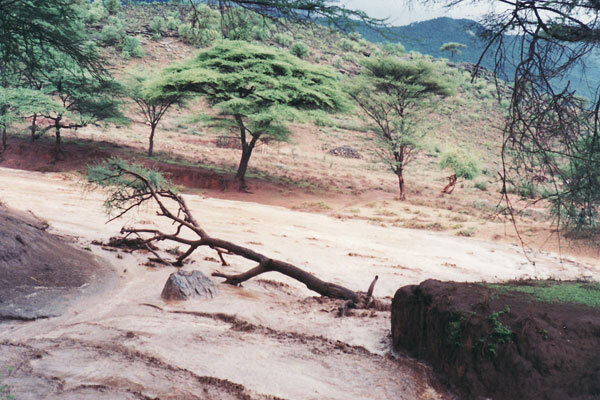 Because the road from Tesseney to Keren was still partially mined, our truck was forced on several occasions to divert off the horrible road into even rougher river beds. It was not an easy drive to say the least. 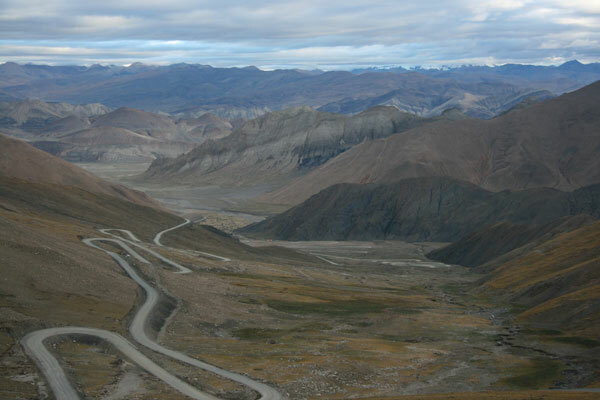 The dirt road to Nubra, often cited as the highest road in the world, is in surprisingly good condition. 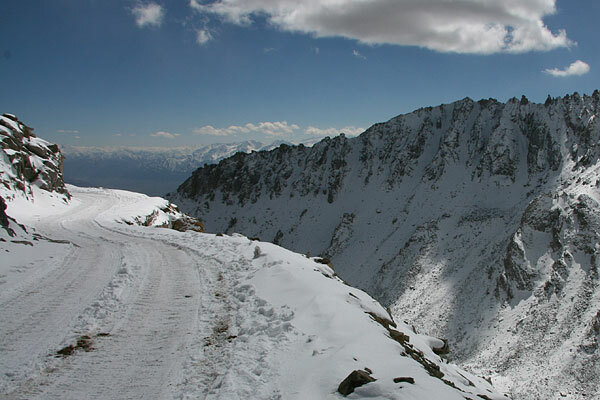 What qualifies this engineering marvel and scenic masterpiece for our list of roughest roads was the altitude as well as the mud and snow we experienced as we approached Khardung La at 5,603 meters (18,380 ft). Our jeep was slipping and sliding all over the place with the hair-raising drop-offs seriously adding to the drama. Our faces were pressed up against the glass taking in the terrifying (I mean stunning) views. But I’ll admit the trip over the mountains was my favorite part of visiting Nubra. 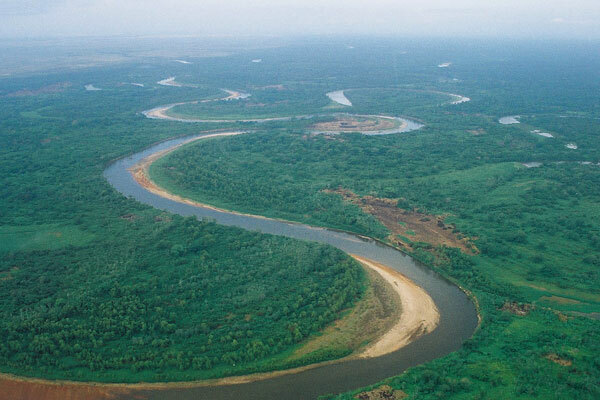 A vast wilderness full of wildlife and amazing tribal culture, the northern half of Kenya as a whole deserves a place on the list. The convoy from Moyale to Marsabit was one of the most exhausting and painful stretches ever as we precariously balanced on the bars above a truck full of goats. It was like riding on a bucking jungle gym for 9 hours. And when the evil driver sped up to try to run down an ostrich (unsuccessfully), we thought we were going to be thrown from the truck. Just days after we did this stretch the convoy was attacked by Somali bandits and several people were killed. We also bounced our way up both the east and the west sides of remote Lake Turkana enduring bandits, deep sand, and flash floods (see pic). In areas, the tracks led over stretches of volcanic rock which literally ate tires. But perhaps the WORST ROAD we have ever traveled EVER was a back road which cut across Pokot territory from Sigor to Kabarnet. Several times, we drove off embankments over three feet high. We made it, but I’m not sure the axle did. The road through the Kinnaur Valley, especially as it approaches Spiti, was the SCARIEST road we have ever been on. No road even comes close. And I pray it will hold that record forever. (Remember that we spent 11 months traveling the edges of the Tibetan Plateau; we have experienced every nightmare road between Chengdu and Srinagar, so this statement means something.) 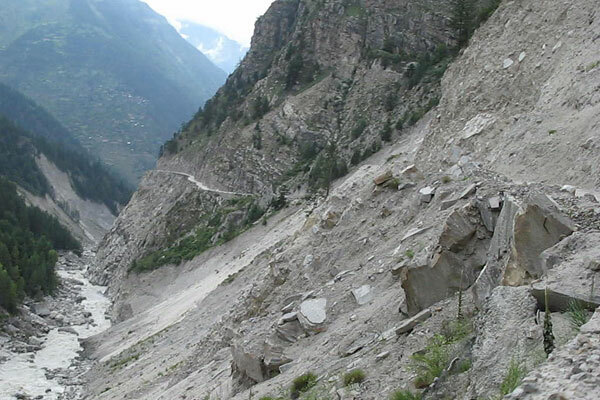 Suicidal Indian drivers, the deadliest drop-offs in the Himalayas, and landslide after landslide make this stretch horrendous. I’ll admit that it was MUCH, MUCH worse because we were on public transportation and our driver was insane; however, Lonely Planet did label this route the worst road in India. 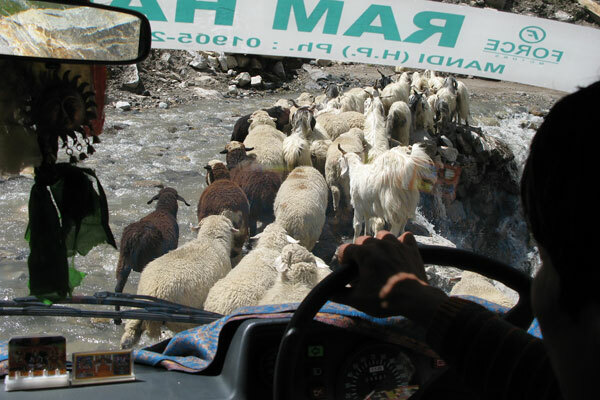 If you find yourself traveling through Kinnaur, just rent a jeep. Of course, we loved the culture and the views as much as we hated the road. I think it’s pretty safe to say that old travel hands agree on very little other than the fact that the Democratic Republic of Congo (ex-Zaire) has the worst roads in the world. The nation single-handedly redefined the pothole to include truck-sized craters. In fact, the roads were so bad when we visited that motorized vehicles had become a severely endangered species. Towns were so cut off that there were totally different exchange rates for dollars in different towns, and plastic water bottles were a more useful currency than cash. To this day, it remains the only country we have ever visited for multiple days without stepping into a motorized vehicle of any kind. We walked in, walked to our destinations, and walked back out again. Now, that’s some seriously bad roads… not that we actually saw them. It’s so good to read about your “pre-blog” adventures. More of that, please! Yeah, we intend to flashback to previous trips this year, which makes a lot of sense because 2013 marks our twentieth year of travel together. you arent joking about the road to fort dauphin. that is the most terrible road in my life. I know. And the scary thing is that’s considered one of the main roads through the country. Although it has been a while since we were there. When did you travel that road? wow your answer was so fast. i still was reading when you answered. i also was on that road many years ago. i think it was 2004 or maybe 2005. I remember reading your post on your adventure in Sumba, Indonesia. I thought it was really tough, but how I am so wrong. I can’t believe you’ve been to some of the world’s toughest places to travel. You guys are amazing! The back roads in Sumba would definitely have been on a slightly longer list of roads. Thomas and I started traveling long before we started the blog. We’re trying to include some older content to show a little how travel had changed. Cambodia has some nasty roads! I almost broke my neck on a number of occasions as the bus bounced from pothole to pothole on my way from Ho Chi Minh City to Phnom Penh. I agree with Kenya being on the list. Saw way too many accidents this past December. Yes Thomas Dembie, the number of accidents in Kenya is terrifying. Actually, if I had written a list based just on terrifying drivers, it would have been very different. It would include India, Nepal, Uganda, South Africa, Kenya, China, Guatemala, Honduras, Thailand (in the 90s), Vietnam. We haven’t traveled in South America yet, but I assume the list might change a little after some travel there. Ohhh this post brings up memories – memories of trying to hold lunch down! I would add Sucre to Uyuni, Bolivia – 12 hours of hell when a short time into the trip the road actually disappeared and we just bounced around on the dirt and rocks. I see some have suggested Cambodia and would certainly agree that the “road” from Kratie to Banlung in the northeast deserves honorable mention!!! Yeah, we’ve done that road to Banlung as well. We were covered in red dirt by the time we got there. In fact, I wiped out on a motorbike on that road. Ouch! Love your website and love, love, love this article! 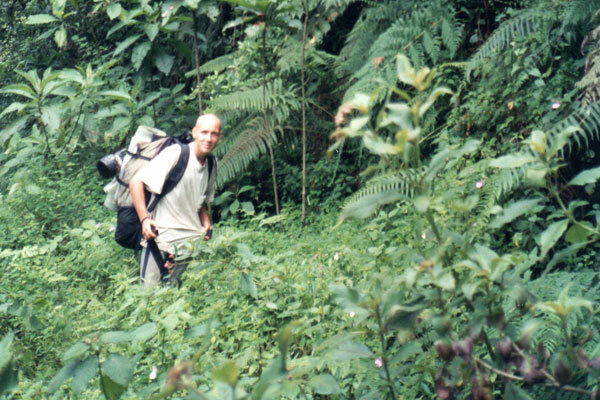 It makes me want to get back on the road… especially in Madagascar! I drove in Madagascar and it was a hair-raising experience. I am used to driving here in Sicily, Italy, sometimes and I thought that would prepate me for Madagascar! Beautiful country though and I had a wonderful experience there.